How much does an asphalt parking lot cost? Paved areas outside buildings used for car, truck and motor vehicle parking can vary widely in size, function, design and cost. Professionals in the Cleveland area often have questions for contractors and bidders, such as Ohio Paving & Construction, about the costs of outdoor parking lot construction and asphalt paving. For detailed answers to questions about costs for the following, please call us at 440-975-8929 or click here to request a site visit from a trained estimator who will do a complete evaluation, go over options and provide a firm quote. For more general pricing please see below. How much will it cost to pave my asphalt parking lot? 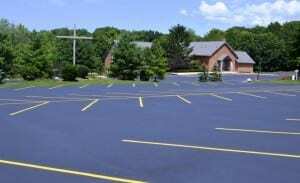 The average cost to construct or pave an asphalt parking lot in Cleveland and Northeastern Ohio is contingent on several factors. The cost of building parking lots can be calculated per square foot or per space/stall although the former is the usual method. Calculating the costs of asphalt parking lot construction, resurfacing, maintenance or replacement requires calculating many variables. There is no “one size fits all” calculator available. A trained estimator will need to do a complete evaluation, go over options and provide a firm quote. 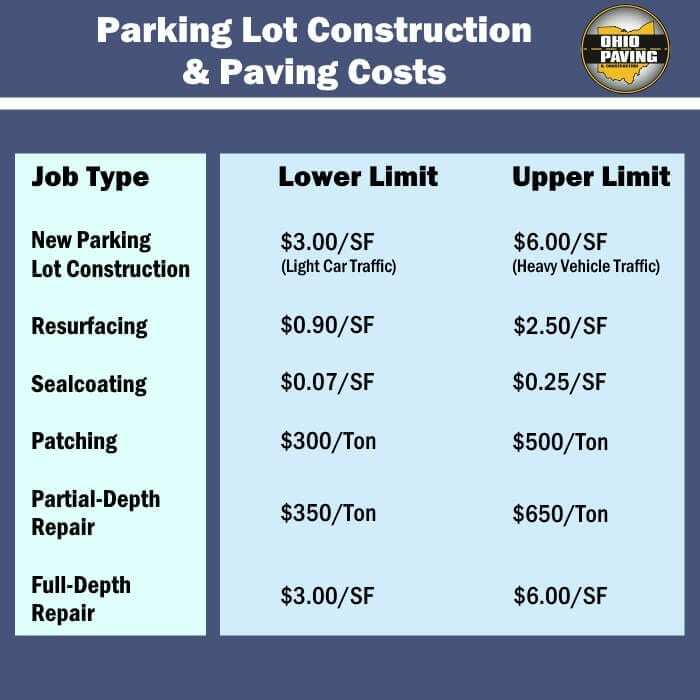 However, to help provide some pricing guidance, below is a list of several different parking lot options, a range of pricing and some of the factors that go into the actual costing of parking lot paving. Major factors to consider when pricing a new parking lot include the following. Small parking lots (25,000 SF / 200 car) average between $75,000 and $150,000 to construct. New parking lot construction can range anywhere from $3.00 (light duty car traffic) to $6.00 (heavy duty truck traffic) per square foot. Milling, “alligator cracking”, leveling course or drainage correction, availability of raw materials and fuel cost volatility, the type of paving company chosen, scheduling, accessibility to the parking lot site and the ease of paving. Small parking lots (10-30 spaces, 4000 to 10,000 square feet) cost between $5,000 and $20,000. Larger parking lots (30-300 spaces, 10,000 to 100,00 square feet) cost between $12,000 and $200,000 to construct. This cost can range in price from $0.90 to $2.50 per square foot. Small parking lots (10-30 spaces, 4000 to 10,000 square feet) cost between $500.00 and $2,500.00. 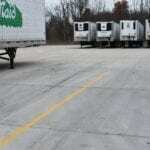 Larger parking lots (30-300 spaces, 10,000 to 100,00 square feet) cost between $600.00 and $25,000.00 to sealcoat. This cost can range in price from $0.07 to $0.25 per square foot. Taking care of minor parking lot issues before they become large parking lot issues can protect your investment and save a lot of money in the long run. When you see areas begin to “alligator” (so called because the area begins to crack resembling the skin of an alligator) and/or pieces of asphalt begin to break loose causing a pot hole, it is essential to make the repairs immediately. First and foremost, these cause safety issues for your customers and employees as well as an eyesore for your business; additionally repairing them early will save thousands in replacement costs later. Repairs can be made by patching, partial depth repair or full depth repair. Patching – Merely refers to filling the pothole with asphalt or doing a skin patch. This is a fairly temporary solution. Costs range from $300 – $500/ton. Partial Depth Repair – This involves milling the failing area 2-3 inches and repaving. Costs range from $350 – $650/ton. Pavement markings can become faded and hard to see over time. Re-striping is an fairly inexpensive way to brighten up your parking lot. Costs can range from $3.00-$5.00/stall or $0.10 – 0.20/linear foot for hashing etc. ; $25.00/handicap, $15/arrow. Minimum charges do apply. Please note that although Ohio Paving & Construction occasionally paves asphalt driveways for homes in Northeastern Ohio at costs ranging from $2,500.00 to $18,000.00, our firm specializes in commercial asphalt paving projects such as parking lots. In less formal and more general situations people often call us or email us with the following questions. In order to answer frequently asked questions we receive from potential customers we have prepared some basic “ballpark” answers about the costs of materials and labor necessary for the construction of parking lots, asphalt paving, asphalt parking lot resurfacing and asphalt parking lot sealcoating. Question: How much does it costs to build or construct a new parking lot? Answer: Small parking lots (10-30 spaces, 4000 to 10,000 square feet) cost between $20,000.00 and $150,000.00. Larger parking lots (30-300 spaces, 10,000 to 100,000 square feet) cost between $75,000.00 and $1,500,000.00 to construct. Question: What is the average cost to pave an existing gravel parking lot? Small parking lots (10-30 spaces, 4000 to 10,000 square feet) cost between $12,000.00 and $75,000.00. Larger parking lots (30-300 spaces, 10,000 to 100,000 square feet) cost between $75,000.00 and $600,000.00. Question: How much does it cost to repave or resurface a parking lot? Small parking lots (10-30 spaces, 4000 to 10,000 square feet) cost between $5,000 and $20,000. Larger parking lots (30-300 spaces, 10,000 to 100,000 square feet) cost between $12,000 and $200,000 to resurface or repave. 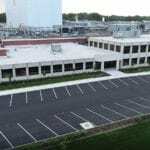 Question: What is the cost to sealcoat an asphalt parking lot? Small asphalt parking lots (10-30 spaces, 4000 to 10,000 square feet) cost between $500 and $2,500. Larger parking lots (30-300 spaces, 10,000 to 100,000 square feet) cost between $600 and $25,000 to sealcoat. Question: What is your average calculated unit price for asphalt paving? Unit? SF, SY, TON? Answer: The average calculated unit price for asphalt paving is $175.00 to $300.00. Question: What is the average cost to construct a parking lot space or stall? Answer: As a very basic ballpark cost, each parking space will cost between $900 to $1,500 to build. Question: What are your prices for parking lot line striping and pavement marking? Answer: Small parking lots (10-30 spaces, 4000 to 10,000 square feet) cost between $300 and $500. Larger parking lots (30-300 spaces, 10,000 to 100,000 square feet) cost between $500 and $8,000 to for line striping and pavement marking. Question: What does it cost to repair cracks in a parking lot? Answer: Small parking lots (10-30 spaces, 4000 to 10,000 square feet) cost between $300 and $600. Larger parking lots (30-300 spaces, 10,000 to 100,000 square feet) cost between $600 and $10,000 to repair cracks in a parking lot. Question: Does your company provide parking lot maintenance services and plans. Answer: Yes, please call 440-975-8929 or email info@ohiopaving.com for more information. Question: I would like to submit a bid or sealed proposal to construct, pave or resurface a parking lot. How do I do so? Answer: Ohio Paving & Construction is always open to submitting a proposal. Please call 440-975-8929 or email info@ohiopaving.com to let us know how to proceed. 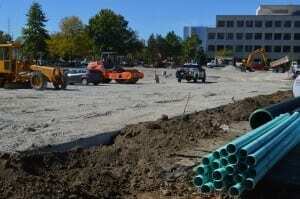 Question: Can you provide us with a parking lot construction cost estimate? 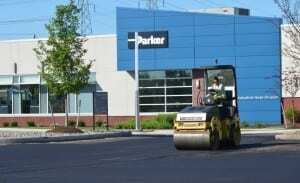 Answer: Yes, Ohio Paving and Construction can provide you parking lot construction cost estimate? Please call 440-975-8929 or email info@ohiopaving.com with your questions or to schedule a site visit.